FatMax Professional Organizer, 13-1/2 in Width, 16-1/4 in Depth, 2-1/8 in Height, 25 Pockets, Crystal Clear Lid FatMax Professional Organizer, 17 in Width, 19 in Depth, 4 in Height, 10 Pockets, Crystal Clear Lid 22 pound load capacity; side katches allow connectivity for easy carrying and safe stacking; removable compartments for small parts and accessories and once removed for power tool and charger; clear and impact resistant unique lid design locks all compartments in place; full visibility for quick access; built-in wide handle for easy and stable portability and metal hinges and latches. Heavy-duty weather & dent resistant aluminum construction. Reinforced frame and corners for added strength. Padded dividers and removable 17 pocket tool holder. Applications: Ideal for tools, hobbies and crafts, cameras and more. 2 Keyed Locks for security. 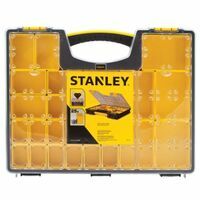 FatMax Professional Organizer, 16 in Width, 19 in Depth, 4 in Height, Aluminum, Crystal Clear Lid, 5.72 lb Weight Solid steel, heavy-duty construction; unit is equipped with 118 of the most commonly used tools and accessories in custom formed tool specific organizers for ultimate storage and quick access; tool kit includes: Hex Key wrenches; 12 oz. Claw Hammer; 10' Measuring tape; 6" Long nose pliers; 9" Torpedo level; Twist drills; Masonry bits; Wood working drills; 8" Adjustable wrench; Screwdrivers; Magnetic Bit holder; Ratchet wrenches: 1/4", 3/8" and 1/2"; 3/8" Spark plug sockets; 2 Extension bars; Drive sockets: 1/4", 3/8" and 1/2"; Screwdriver bits: 25mm and 50mm; 18mm Zinc Alloy Knife; 10" Groove Joint pliers and 6" Lock Grip pliers; Ball bearings keep the drawers operating smoothly and minimizes wear and tear. Heavy duty drawer slides with 100 lb capacity; thicker gauge steel body for increased durability; 10-3/8" deep top lid provides enough space to stand up "Dewalt" cordless power tools; auto return drawers keep drawers securely closed while maneuvering around work site; 18" drawer depth and heavy duty casters.